Radiant, hydronics, geothermal -- they are a vital part of modern comfort and energy solutions. ACCA helps hydronics contractors operate at peak performance. In fact, ACCA is home to the largest number of hydronics contractors in the country. These contractors, and many others who seek to enter this market, rely on ACCA to help them learn more about the specialized technical needs of these heating and cooling systems. And hydronics contractors also come to ACCA for resources and support related to running and growing their businesses. ACCA offers exclusive member resources to help contractors offer the whole array of modern heating and cooling systems, including radiant and hydronics. I=B=R is the industry standard for training in residential hydronic heating. 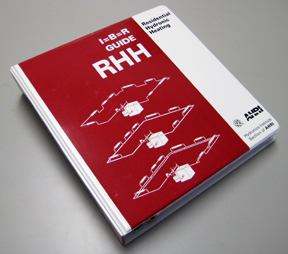 An essential companion and resource for any installer. Over 350 pages of narrative, tables, and color graphs. Covers every aspect of home hydronic heat­ing - from the fundamentals of boiler operation to sizing and system design. Targeted toward professional installers and ideal for instructors. The Radiant & Hydronics Council is an advisory committee of member contractors who offer insight and advice to ACCA's staff and Board of Directors on issues related to radiant panel, hydronics, and related systems. They help identify industry issues and suggest ways in which technical staff might support contractors on hydronics issues through standards and codes. Current chairman of the RHC is Dan Foley of Foley Mechanical. He also serves as a member of ACCA's Board. ACCA members receive a special newsletter featuring articles and resources related to Radiant & Hydronics. Check out archived articles from the newsletter here. Each year, thousands of America's best contractors, including the country's top commercial contractors, convene at the ACCA Conference, held in conjunction with IE3: The Indoor Environment & Energy Expo. The ACCA Conference features a special program track on Radiant & Hydronics, focused exclusively on both residential and commercial radiant panel, hydronics, geothermal and related contracting services. Top contractors share real techniques for expanding into these markets, improving your technical proficiency, and growing your profit margins. Additional program tracks offer in-depth learning on leadership and strategy, business operations, residential HVAC, commercial HVAC, and more. Interested in participating as a faculty member at an ACCA conference? Share your experience and best ideas with your peers. Contact conference@acca.org for more information.